Imagine walking up to the Mona Lisa, removing it from the wall, and carrying it down the corridor for a private viewing. Keep it as long as you like! It seems absurd, doesn’t it? And yet that was possible a century ago. Museum policy permitted photographers to remove art from the Louvre’s galleries with no prior request. Security at the Louvre has improved substantially since then. For that — credit its infamous failure in 1911. A museum visitor, anxious to see Leonardo da Vinci’s Mona Lisa, grew impatient one summer morning. The painting was gone and the security guard assumed it was down in the studio. Later, feeling his entire morning was being wasted, the man inquired again. Museum personnel casually asked around and checked the studio. “Anyone have La Gioconda?” Only when met with silence did museum officials begin worrying. And rightly so. The Mona Lisa had been stolen. 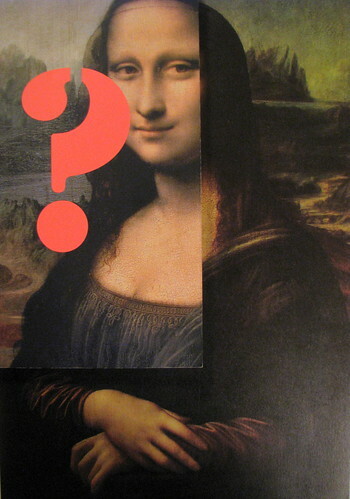 Before reading R. A. Scotti’s Vanished Smile: The Mysterious Theft of Mona Lisa [LibraryThing / WorldCat], I knew Leonardo’s masterpiece had been stolen long ago, but had long forgotten any details. That made the story all new to me. The author describes the last day at the Louvre before the theft, the slow realization that it was missing two days later, the flurry of police activity, and the fury of popular opinion. The theft catapulted the well-known painting into a popular culture icon. Mona Lisa became the most recognizable portrait in the world that summer. It was said that there had never been a line to enter the Louvre before the theft, and yet when the museum reopened a week later, thousands of visitors queued to see the four hooks on the wall where the Mona Lisa had been. I found that both amusing and astounding: Parisians lined up to NOT see the painting. Scotti follows with chapters on the investigation and the rampant speculations. Theories included wealthy American art collectors, botched conservations, and workers making a labor statement. Young Pablo Picasso was even involved in the case; he was held and questioned for a time. The painting was eventually recovered (you knew that) and given a much more secure home. This was an enjoyable read. I’ve read about Leonardo and his art many times before, but this book centered much more on crime and detection than art. It reminded me of Matthew Hart’s The Irish Game, a book I read (and reviewed) two years ago about another famous art heist: A Vermeer taken from an Irish country estate in the 1980s.